Knowing and understanding a horse, being aware of their moods and habits, is a talent that money can’t buy. 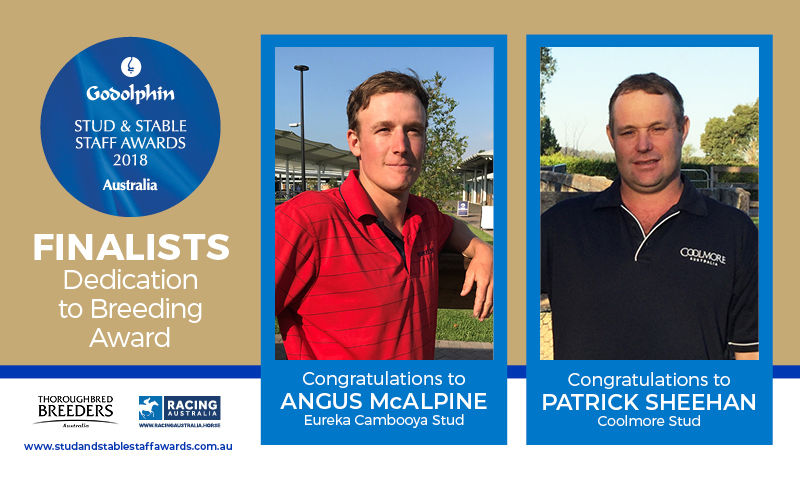 It is also a skill that is well advanced in the Dedication to Breeding finalists, Angus McAlpine from Eureka Cambooya Stud and Coolmore’s Patrick Sheehan. “Angus knows every brand on every horse. He learns their temperament, their habits, everything there is to know about them,” said his nominator, Jordan Priest. “The awards are a fantastic concept and as much as I’m humbled and honoured to have been nominated, that’s not why we do what we do – we do it for the horses,” said Angus. Paddy Sheehan is Coolmore’s foaling manager and someone whose contribution is impossible to overstate, according to Tom Magnier, the farm’s principal. It is an assessment backed up by Segenhoe Stud’s Peter O’Brien, who describes Paddy as the most talented and diligent man he has ever worked with. For Paddy it is “an honour and a privilege” to once again be a finalist. “I’m very proud to be nominated and thankful to Godolphin and the organisers for acknowledging people who aren’t known outside the place they work, but who all do a fantastic job,” he said.